All the info you could ever need about Tour de Fleece here. The tour starts on July 4th, but I think I have figured out what I want to spin already. I will probably change my mind about it a bit (a lot) after we start. I hope to do daily picture posts (probably won’t have time to write much). 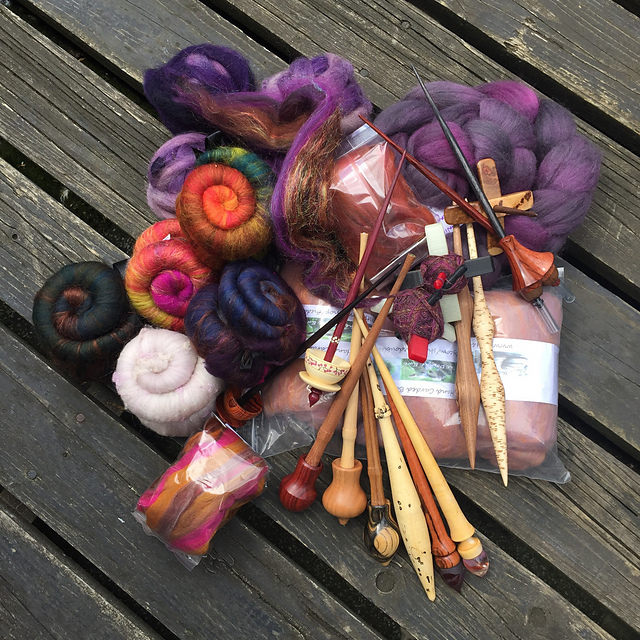 This is an awesome chance to spin some fiber from some of my favorite suppliers on some of my favorite spindles (and wheels – more about that at a later date). So far I have fiber from Nunoco, The Double Ewe, Fondant Fibre, Hilltop Cloud, Porpoise Fur (forgot to include that in the picture), and Barber BlackSheep (picture below). I will also be spinning on my wheels (Little G and Big G). So that update thing… not going too well. I have been a little nervous about updates since I did the Golding update and afterwards ended up destashing every spindle but one (the starfish). I think writing the post made me realize that I just did not use them enough to justify keeping them. Now I am giving it another try with spindles that I am almost sure I will keep. Neal Brand “Shorties”: Zebrawood/Ebony, Tulipwood/Holly, Bloodwood/Ebony, and Black Palm/Ebony. My Neal Brand tibetan was one of my first supported spindles. It seems that a lot of the good makers of supported spindles have quite a back log of orders, so it takes a while to get your spindle. Neal’s spindles are amazing quality, but he is also very fast. He usually has a monthly special in his Etsy store, and every time I have ordered; it has taken less than a month to get the spindle. My first Neal Brand Purchase was a set of three tibetans and a bowl (this is the link to the original Etsy listing). One was a monthly special with an Ironwood whorl and a Wedge shaft. 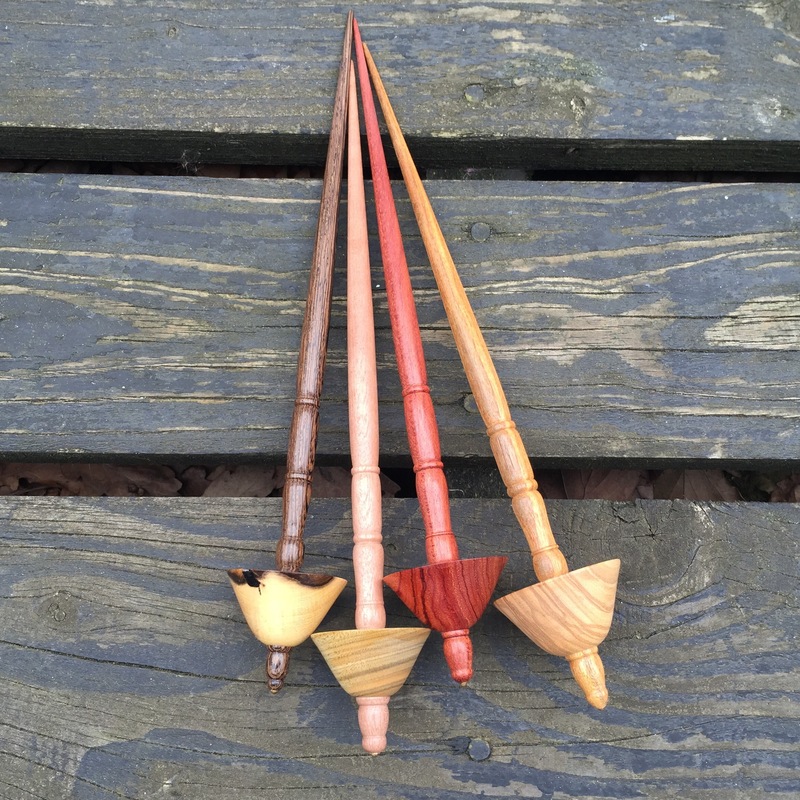 The other two were my choices of woods (Zebrawood/Ebony and Tulipwood/Bloodwood). Neal’s spindles are incredibly well balanced and smooth (both surface and spin). They all have pointy metal tip, so I don’t use them in wooden bowls. Neal brand spindles at work. The bowl is from Debs Fibers. After trying the spindles out; I pretty much feel in love with their design and ease of use. They are very forgiving for a beginner. I thought it was really interesting that Neal is a math professor and has used that to optimize the design of the spindles (my brother has a PhD in math and I don’t see much in the way of spindles coming from that direction!). Neal is also very responsive and great to work with. 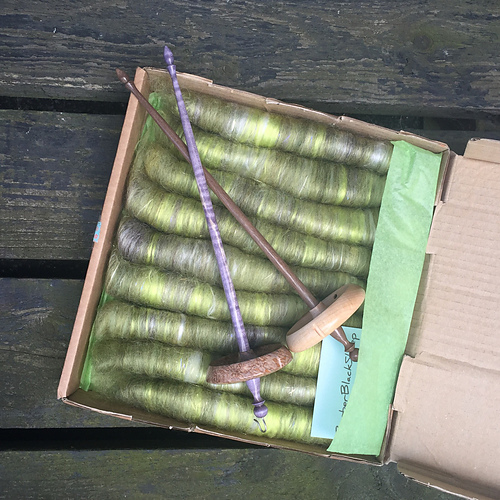 I later ordered several other spindles in different lengths so I now have a quartet of shorties (around 9 inch length) and a quartet of “Longies” (around 11 inches in length). Both sets are wonderful. 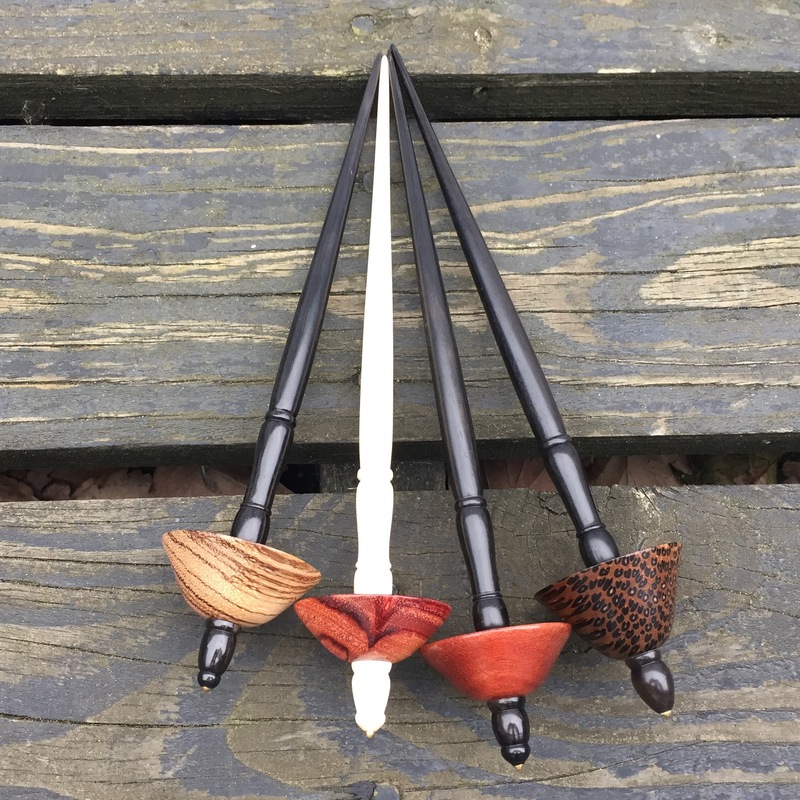 For my latest order; I decided to let Neal pick out the woods and he made a couple of AMAZING spindles in Black Palm/Ebony and Olive/Canarywood. Neal also makes spindle bowls (I have two but they are hiding) as well as phangs and Russian spindles. I have held of on those so far since I prefer my phangs and Russians to have a less smooth surface than Neal’s spindles. 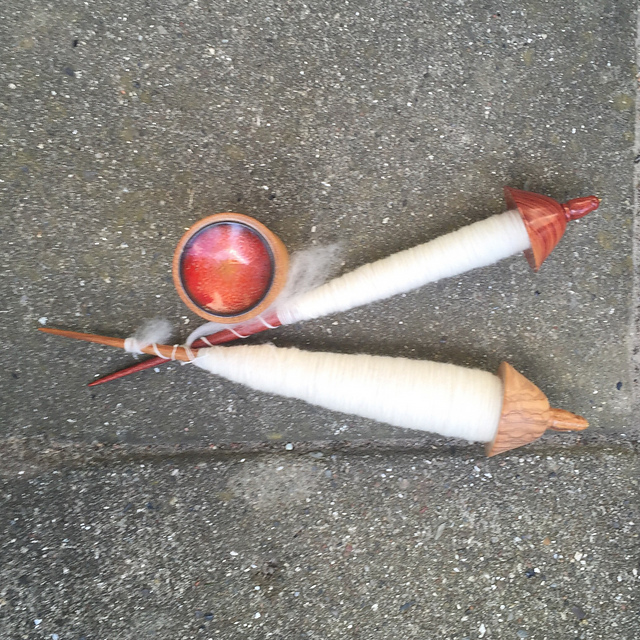 If you are looking to try out supported spindles; Neal’s tibetans is one of the best places to start. If you are picking woods; I highly recommend Bloodwood (somehow he gives it this amazing glow), Tulipwood, or Black Palm for the whorl. Neal makes these 3 woods look absolutely beautiful.